LAS VEGAS — President Trump ventures into an emotionally fragile and politically divided Las Vegas on Wednesday, less than 72 hours after the worst mass slaying in modern American history. He will find a city skeptical about any political leader’s ability to offer solutions and real healing. The president, who narrowly lost the state in last year's election, will find some people ready to listen and many convinced that he cannot help. The skepticism mounted for some on Tuesday, when Trump’s remarks in Puerto Rico about the devastating hurricane that ripped through the island seemed to minimize the damage there. Robby LeBlanc, a Republican who voted for Clinton last year, shook his head as he used his smartphone to replay the president’s comments Tuesday on Puerto Rico. 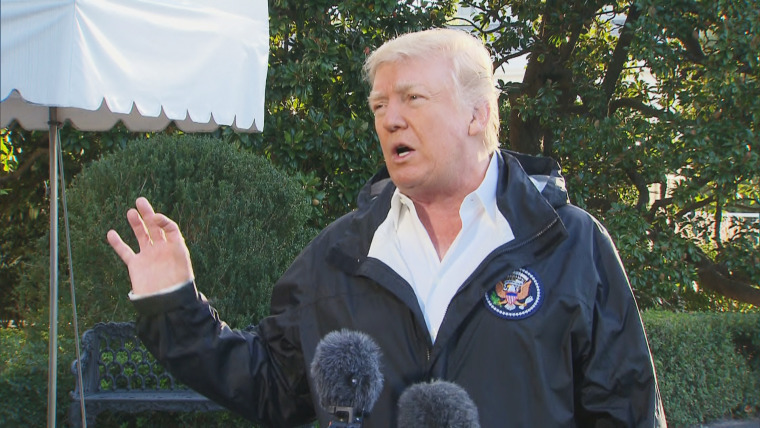 Trump suggested that the U.S. territory was costing the government dearly because of damage from Hurricane Maria and that the storm's impact paled in comparison to that of Hurricane Katrina in 2005. LeBlanc’s companions — Sabrina Fricks and Lynn Frankenberger — made it clear they also were not fans of Trump, but said they thought it was important to give him a chance to bring people together. Frankenberger, a lay minister at a church in Las Vegas, said she had been impressed by a young man who spoke at a prayer vigil for the 58 people who were killed at a country music festival just off Las Vegas Boulevard. In a visit to Las Vegas nine days before last fall’s election, Trump torched his Democratic opponent, Hillary Clinton, for “criminal” behavior and gloated over the sexting emails of Anthony Weiner, the former Democratic congressman and estranged husband of a top Clinton aide. Trump was blown out in Clark County, Nevada's population center that includes Las Vegas, by a deficit so large that Clinton managed to squeeze out a 47.9 percent to 45.5 percent victory in the state. The president indicated on Tuesday that he might be open to reopening a discussion on the topic of gun control, a volatile issue in Nevada. “We’ll be talking about gun laws as time goes by,” he told reporters. But it seemed unlikely that time would come during his visit Wednesday, so shortly after the attack here, which injured more than 500 people. Some Las Vegans said they thought Trump’s visit could do some good. Marcus Moreland, a Democrat and restaurant deliveryman, said he did not vote for Trump but also believes his visit is important. “He can tell people to keep striving and to keep up what they do every day,” Moreland said. CORRECTION (Oct. 4, 2017, 1:30 p.m.): An earlier version of this article misstated the surname of a companion of Robby LeBlanc. She is Sabrina Fricks, not Franks.